Put the milk in the bowl.Add 1 teaspoon of the sugar and yeast. Stir to mix. Set aside for 15~20 minutes. Sift the plain flour and baking powder into a large bowl. Add the remaining 1 teaspoon sugar, the yeast mixture, the 2 tablespoons olive oil, the yoghurt, 1/2 teaspoon salt and the egg. Mix and form a ball of dough. Put the dough on to a clean work surface and knead it for 10 minutes or more until it is smooth. Form into a ball. Pour about 1 teaspoon oil into a large bowl and roll the ball of dough in it. Cover the bowl with a damp tea towel and set aside in warm place for 1~3 hours or until the dough has doubles in size. Punch down the dough and knead it again for 1 minute. Divide into 5~7 balls. Roll this ball into a tear shaped naan. Use rolling pin. Makes naan about 2~3mm thick. 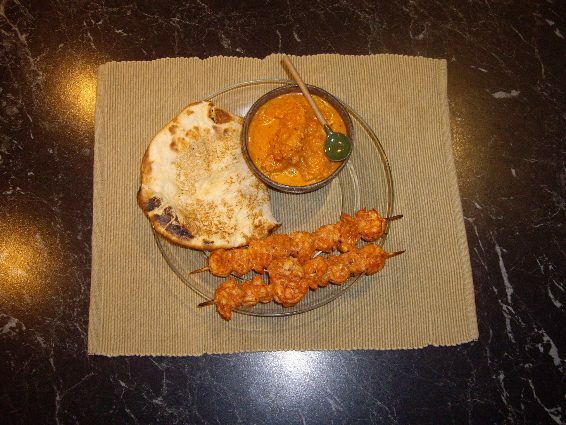 Serve with your favourite Indian Curry.